We’d love your help. Let us know what’s wrong with this preview of Twisted by Steve Cavanagh. Is there graphicviolence or child abuse? How much did Maria bleed to fool J.T LeBeau? Twisted’ is a novel that certainly lives up to its name! I think it’s best if I don’t go into detail with this one - the less you know the more you’ll enjoy it. Suffice to say though that this psychological thriller had me turning the pages rapidly to see what happened next. The writing here is absolutely first rate and takes us into the dark world of an obsessive, where any rationale is entirely his, not ours; where the central figure’s view of his actions leave room for little else. The pace is relentless - a bumpy ride down a long road, and when the main protagonists are drawn ever closer together, the outcome may not be so great! Excellent! Paul Cooper, a sales management consultant is married to Maria, and the couple moved to Port Lonely to live. Paul is a man with secrets who has maintained a distance from his wife, which has led to her feeling increasingly lonely and isolated in this tiny wealthy community. Maria has assuaged her inner need for human connection by taking a lover, Daryl, an impoverished country club instructor and waiter. As her feelings for Daryl grow, Maria teeters on the brink of making the momentous decision to either stay with Paul for financial security or to settle for Daryl and poverty. She feels an inner rage when she accidentally finds evidence that Paul has been concealing huge secrets that make her feel she barely knows her husband. She begins to concoct plans to make him pay for his deceit and consolidate her future with Daryl. When Sheriff Abraham Dole, and his Deputy of very few words, Melissa Bloch, are called in to a break in at the Coopers home, they can feel something is off, particularly when nothing is taken. This turns out to be the beginning of an investigation for them that is to test them to their limits as it spirals in completely unexpected directions, and begins to take in a long ago case that involved the murder of a woman who was never identified in Port Lonely, a case Dole has never forgotten. This is a story of a rising body count in murders, of characters that are nothing as they appear, unreliable memories, and two authors in the process of writing their latest books, one a murderous predator, the other trying merely to survive. What a cleverly written book this was. This is definitely written for readers. And most definitely for those that love deeper twists in books that they think they’ve worked out.......but I beg to differ. This was a puzzled within a puzzle. Just who is this writer, no face, no identity? Really made me sit up and take notice! I do own one of his other books. Not read.....yet. But this sure is an eye opener to talent. And this book does not fail with its promises of twists, there are so many I lost count. If like me you love Crime thrillers you will surely enjoy this one. Quickly becoming a firm favourite author of mine. A brilliantly twisted and oft unexpected standalone thriller from Steve Cavanagh, probably the most fun you'll have with a book this year. Bit of a rollercoaster with some insane characters and a terrific finale. Clever and hugely addictive. Full review to follow for the tour. J T LeBeau, the author of Twisted, is a multi-million dollar best-selling author, hiding behind a veil of secrecy. Their publisher doesn’t even know h Twisted is one of those thrillers that the less you know of the story beforehand, the more thrilling the ride. It’s difficult to go into detail about the plot without giving away spoilers, so this review will be a brief one. I should mention that this is a standalone and although lawyer Eddie Flynn does get a mention, it is not part of that series. and so so different I found it not for me, I didn’t connect with the characters or the writing style this time and thats where I will leave the review!! This is without a doubt where the title of the novel absolutely lives up to it’s name! What to say about this book. I really don’t know where to start and even then it is actually very hard to say much about it at all without giving anything away. This one will probably be one of my most evasive reviews so far and for that I won’t actually apologise, as believe me when you read this book for yourself you will be glad I didn’t really tell you anything. Now what I will tell you is that this novel is This is without a doubt where the title of the novel absolutely lives up to it’s name! Now what I will tell you is that this novel is utterly brilliant. The story line is just phenomenal. So many times I had to go back and re read what I had just read as I struggled to comprehend what I was reading. I really don’t mean that in a bad way either. The twists when they start coming, come thick and fast, of which some totally floored me. It’s one of those books you want your friends to hurry up and read so you can see if they saw any of it coming or if it took them by total surprise also. Twisted is the most twistiest of books I have ever come across. It totally messed with my head, shocking and surprising me, yet thrilling me all at the same time. There is no other story like it that I for one have ever come across. If you love a story with a good twist, and come on, who doesn’t? Then hands down they don’t come any better than this. Usually when I give a review I give a general summary of the story. However, I think the less said about this story the better. Your better off going into this book with no clue. It was a hell of a journey, when I thought I had got to grips with the story I was then smacked across the face with a claw hammer and made to question everything. As soon as I got comfy again I was then stabbed in the back and thrown overboard. Wow where do I begin, every now and then I love a good Thriller and after looking through @net I came across Twisted, I recognised the authors name after seeing a lot of people posting about Thirteen on Bookstagram, which I am yet to read! So I started this book two days ago and finished it last night! And what a book it is! We follow the story of a mysterious writer called J.T Lebeau, he is renowned world wide but no one knows who he is?? We meet our 3 main characters and the police force. •No one knows who I am! Or how I did it..
•If you think you have found me...I am coming for you next. The book is so clever and the title is fully fitting with the story line, I was wrapped up into the world and the characters I seriously couldn’t get enough! So I am watching all of you.... Put this on your TBR pile or Me and J.T Lebeau are coming for you.. Okay I will start by admitting that it’s not me. I am NOT J.T. LeBeau! Or am I?! Yes, Twisted is one of those books that will knock your socks off and then make your toes curl with pure enjoyment of it’s fast paced, brilliantly crafted plot. Everyone knows I LOVE a twisty book but am often disappointed because I’ve managed to work the twist out from page one. Not that I let that spoil my enjoyment of thrillers as it’s never all about the twist for me. But when the first twist hit me in Twisted, I was like WHAT??? It certainly wasn’t expected and was the first of many twists and turns that all came as total shocks to me. And I absolutely loved this book for each and every one of them! I won’t go into plot details as all I want you to know is in the blurb above and I want readers to go in blind to this one. It’s a standalone novel and not an Eddie Flynn instalment but he does manage to get a little mention in there that made me smile! But the star of the show here is J.T. LeBeau and boy, does he know it! Deanna I'm excited to read this! :) Great review!! Joanne Robertson You should be! It’s fabulous!! Steve Cavanagh’s mind is criminally brilliant. Never has a title been so spot-on. If you haven’t added this book to your list, I’m coming for you. Steve Cavanagh’s name is everywhere. I was lucky to see him during Bloody Scotland but my copy of Thirteen is still waiting for my eyes to dissect it. Still, I had a feeling the guy would push all my favourite thriller buttons. He did more that this! Insanely good, Twisted is a standalone that reminded me of a carousel. You start spinning slowly, and when you think you’re getting used to the landscape around you, you get punched by the bear you’re supposed to be grabbing. Gobsmacked by twists thrown at you at each turn, you don’t realise just how fast things are going and before you know it, you’re short of breath and completely addicted! I am giving NOTHING away about the storyline. But let me tell you that it is sickly entertaining, stunningly penned, and brought to life by a perfect cast of protagonists. Twisted is one of those novels that make you re-read a sentence because your brain can’t process the bombs the author has hidden throughout. You think you know where you are going but you end up lost in the woods. Oh and what woods… Killer woods with prey and hunters. Are you up to the game to find out who’s who? This was my first Steve Cavanagh book and after hearing about this author all over the social media, I was excited to read this book. With much ado, over the weekend I opened my kindle to read, the prologue was soo intriguing!! The storyline was twisted and went thus, J. T. LeBeau was this famous bestseller but elusive author whom no one had seen ever. Paul lived with his wife Maria, and she found a bank statement for twenty million dollars credited to her husband from LeBeau Enterprises. And th This was my first Steve Cavanagh book and after hearing about this author all over the social media, I was excited to read this book. My interest rate spiked, my pulse raced initially. And then I got stuck... Not in a good way... I got bored. But I persevered, and the book picked up its plot and its pace. There were many twists and turns, all of them steep and confusing. I could guess the plot easily because there were only 3 characters. The cat and mouse game kinda became obvious. It was still interesting as the author's writing had the power to pull me in. Then there came a major medical flaw. There were 2 of them but I let go of the first one because miracles happen in the medical field, the second I couldn't let go. This review has been hidden because it contains spoilers. To view it, click here. TWISTED yes this book certainly is and for all the right reasons. This is the first book I have read by this author and it will definitely not be the Last. Infact I am already searching for and downloading more of this authors work right now. IT IS SO GOOD. This author has the knack of leading you in one direction and then throws a curve ball and now you have no idea what the he'll is going on. This does not happen just once oh no this happens so many times you just don't know anymore. This book TWISTED yes this book certainly is and for all the right reasons. This is the first book I have read by this author and it will definitely not be the Last. Infact I am already searching for and downloading more of this authors work right now. IT IS SO GOOD. This author has the knack of leading you in one direction and then throws a curve ball and now you have no idea what the he'll is going on. This does not happen just once oh no this happens so many times you just don't know anymore. This book had me holding my breath, shouting at it, sat on the edge of my seat and tapping my kindle faster and faster. In all the years I have been reading I have never read a book quite like this one. This is crime thriller writing par excellence. Addictive, gripping and darn right TWISTED. I cannot wait to delve into more of this authors work. So highly recommended and an easy five stars infact I award this book ten stars if I could. I LOVED IT AND MUST READ!!!!!! I was rather underwhelmed by Twisted. I had heard that Thirteen was very good, so I thought I’d try this one, but it seemed pretty run-of-the-mill stuff to me. The plot is based around a reclusive, mysterious author, JT LeBeau, whose books make millions but whose life seems to be involved with a number of murders. To say more would be a significant spoiler. The thing is, the book is constructed entirely so that there can be “Twists”. (And just in case we don’t admire them sufficiently we’re even I was rather underwhelmed by Twisted. I had heard that Thirteen was very good, so I thought I’d try this one, but it seemed pretty run-of-the-mill stuff to me. The plot is based around a reclusive, mysterious author, JT LeBeau, whose books make millions but whose life seems to be involved with a number of murders. To say more would be a significant spoiler. The thing is, the book is constructed entirely so that there can be “Twists”. (And just in case we don’t admire them sufficiently we’re even told by a character how very difficult this is.) I am prepared to suspend disbelief, sometimes from a considerable height for a really good book, but I found a lot of Twisted rather silly and a bit dull. The opening hundred pages or so are padded with masses of tedious and largely irrelevant detail about unconvincing characters’ lives, thoughts and so on, to the extent that I kept suspecting that the author was paid by the word, thinking “get on with it!” and skimming judiciously. I didn’t miss anything important. When things did begin to happen, nothing was much of a surprise and there are some ridiculous coincidences and some utter implausibilities: for example, a character who is obsessed with concealing his true background isn’t really sure where he left a vital document which may or may not have been stolen. Really? Later, another similarly obsessed character leaves his laptop alone with someone else and available to be read, to the extent that it doesn’t even require a password to bring it out of sleep mode. Huh? Even mine does that. And so on. It’s well enough written to be readable, but the knowledge that we’re always being set up for the next Twist made it unengaging for me, and that knowledge meant that I saw several of the Twists coming. The ending is absurdly silly and I wasn’t all that sorry to finish it. This might be OK for a brain-off beach read or the like, but nothing more. I recently read Thirteen which I thought was an exciting and suspenseful thriller. I regret that I don't consider Twisted as compelling, I felt I was reading an exercise of inserting twists into the plot, which made them seem forced and contrived. Since I was waiting for the twists, I was neither surprised nor shocked when they occurred, no matter how unlikely or unbelievable they seemed. As the main characters were all devious and secretive in their own ways, I was unable to feel an emotional c I recently read Thirteen which I thought was an exciting and suspenseful thriller. I regret that I don't consider Twisted as compelling, I felt I was reading an exercise of inserting twists into the plot, which made them seem forced and contrived. Since I was waiting for the twists, I was neither surprised nor shocked when they occurred, no matter how unlikely or unbelievable they seemed. As the main characters were all devious and secretive in their own ways, I was unable to feel an emotional connection or care much about what happened to them. The book involved police work often based on theories due to lack of hard evidence. There is a multi-million dollar author involved named Le Beau. His fame and wealth are based on great twists in his widely popular crime stories. Perhaps he is a killer, basing his stories partly on murders he has committed. The problem is that no one, even his publishers have ever seen his face and no photo exists. His identity is unknown and subject to much speculation. There is a faithless wife who feels neglected at home. She is carrying on a passionate affair with a bartender/diving instructor. They come up with a duplicitous scheme which would result in them being together and living in luxury. Twisted repeatedly takes you to the brink, leaves you there, then comes back for more. Undeniably, it’s a story that has several stings in its ‘tale’. Having plot spirals wound tighter than coiled springs, just when you think you’ve got it all straightened out another one pops up! This considerable scheming is sustained, all of which is consistently sharp, bold, and controlled throughout. Although I didn’t settle into the ride straight away, once I became comfortable with the direction the book wa Twisted repeatedly takes you to the brink, leaves you there, then comes back for more. Undeniably, it’s a story that has several stings in its ‘tale’. Although I didn’t settle into the ride straight away, once I became comfortable with the direction the book was steering toward it floored the accelerator and I read non-stop ‘til the end. It would be absurd of me to attempt to outline even the basics of the plot. I’ll just say that although events may skirt around the edges of credibility they present opportunities for pure, undiluted thrills and a massive dose of second-guessing for any reader! A somewhat insignificant thing I appreciated was the blink-and-you’d- miss-it ‘cameo’ role of fictional lawyer ‘Eddie Flynn’. There’s no lasting connection or relevance to this story, just a subtle and brief nod to the seasoned star of this author’s other well-established novels. I thoroughly enjoyed watching the integrity of the characters unravel and seeing how the many devious threads of their stories tied together. Nicely done. This is a book I am not quite sure what I can say about this to you without actually talking about the story in this book! I am sure every review on this tour has pretty much said the same, I know what I have read has said this! So with all the hype, did I really think it was going to live up to the expectations? Erm….well yes I did! The opening chapter is a scene that is the “present day” and then you are taken back four months ago. In these four months, you think you get to a stage where you ha This is a book I am not quite sure what I can say about this to you without actually talking about the story in this book! I am sure every review on this tour has pretty much said the same, I know what I have read has said this! So with all the hype, did I really think it was going to live up to the expectations? Erm….well yes I did! The opening chapter is a scene that is the “present day” and then you are taken back four months ago. In these four months, you think you get to a stage where you have “worked” it out, but like its namesake, you would be wrong with the twists. So ok, you reset yourself and what you know, with what you think you know. It is then like a being on an episode of Catchphrase and getting a wrong answer, that buzzer sound was going off in my head, with the phrase “Survey says” no, no chance, try again! And on it goes. When we get back to “present day” you re-read the opening chapter and it all has a completely different take the second time around, did I have a light bulb moment, yes, YES I DID! Was I right? Kind of. Were there more twists to be thrown at me? Bloody hell, it is like a never-ending corkscrew! I think Linda Blair’s head in Exorcist may have twisted around just as much!! The ending dealt a final blow that took my breath away. I found the writing so easy to get lost in, and if I did not have to do adulting then this would easily be a book I read in one sitting if I was given the chance to. It was easy to get to enjoy the scenery of Port Lonely, not that I ever want to go there! I loved the pacing of this book, I never felt that this was dragging in any place because when the action did calm down a little bit, you were on edge trying to anticipate what would happen next. Like a chess match, you are always trying to anticipate your opponents next month and at the same time plan your next five. I received a free digital copy of this book from the publishers/author via NetGalley in exchange for an honest review. A best-selling author who remains anonymous, a serial killer and $20 million, what could go wrong? JT LeBeau is a world-famous, best-selling author but no-one knows his real identity. When Maria Cooper finds something odd about her husband Paul, she believes he may somehow be involved in the author’s mysteries, and his millions. But Maria’s scheming soon ends in tragedy and a kill I received a free digital copy of this book from the publishers/author via NetGalley in exchange for an honest review. JT LeBeau is a world-famous, best-selling author but no-one knows his real identity. When Maria Cooper finds something odd about her husband Paul, she believes he may somehow be involved in the author’s mysteries, and his millions. But Maria’s scheming soon ends in tragedy and a killer is waiting to strike. I loved this book, and it is the perfect novel for people who just love reading and everything to do with books. Who can resist a story all about mysterious authors, I certainly can’t. This novel was seeped in so much mystery and dark intent, it was hard not to suspect and mistrust every single person yet still be surprised when they acted in ways that were untoward. The story spiralled in so many different directions before arriving at a fantastic climax that left me gasping. This book is set in the same world as Cavanagh’s Eddie Flynn series, as there’s mention of Flynn from another lawyer at one point. I love when authors include little easter eggs like that in their book for the different characters they have created. I also loved that this book was called the same as the LeBeau’s book in the story, it gave the whole thing an even deadlier, creepy air to it. There were some things I felt were a bit implausible at times, and not realistic which made me bump the story down a star but overall I was left utterly gripped, and I genuinely could not put this book down until I’d read the last page. I’ve not read any of SC’s books before, but if the pacing and excitement in this book is the same in his other titles I seriously need to stock up on the backlist. This plot was so enticing and full of drama and I genuinely couldn’t stop reading (oh hello 2am, no I’m Whoa! This plot was so enticing and full of drama and I genuinely couldn’t stop reading (oh hello 2am, no I’m not worried that I have to get up at 7...) and the end was brilliant! Guaranteed to be one of the most talked about thrillers of 2019. Winner of the 'hardest book to review ever without giving out spoilers!' It certainly lives up to its name and the hook of the blurb and its questioning of 'Who is JT LeBeau.' This is a very addictive thriller which has a lot of fun messing with the idea of the thriller book with a twist. In many ways it's a book about writing, but done so in a cool, punchy and rather meta way. A cracker read. A clever novel that plays on several levels with 'the twist' and is indeed twisty in its own right. For me, it all feels a little like it's an exercise in how to write a thriller, which comes at some cost to characterisation, but it's still a lot of fun. Review to follow shortly on For Winter Nights. Initial thoughts: I'm still shaking. Why did I think this was the latest Eddie Flynn novel? (By the way, it's not, however he is mentioned by name in one conversation, twice.) I absolutely love the concept of this book which I suppose we have to credit Steve Cavanagh's wife for, it makes for a killer story and just when you think you know something, you realize you don't know anything at all. In Steve Cavan Initial thoughts: I'm still shaking. Why did I think this was the latest Eddie Flynn novel? (By the way, it's not, however he is mentioned by name in one conversation, twice.) I absolutely love the concept of this book which I suppose we have to credit Steve Cavanagh's wife for, it makes for a killer story and just when you think you know something, you realize you don't know anything at all. In Steve Cavanagh’s latest hit, Twisted, he experiments even further with outrageous plot ideas. A book inside a book (inside a book), there is no telling the difference between truth and fiction on the lines of these pages. Some characters are portrayed the way they want to be seen, while others are introduced in a different light, manipulated by the view of the book’s mysterious author J.T. LeBeau. Although this book does not feature the beloved Eddie Flynn from other Steve Cavanagh books, his name is cited twice in this book, both in the span of one conversation. I absolutely love morally grey characters, and Paul Cooper is most certainly one of those. There is a brilliant balance between how his wife, Maria sees him, shown when she is speaking about him, and how J.T. LeBeau chooses to display him as a character in the book. It only becomes obvious much later in the book who Paul Cooper is, and what is hidden in his murky past. This book is so much more than a quest to find out who J.T. LeBeau is, though that in itself is an epic journey as most readers will note that the mysterious author has at least three potential identities. Whenever you think you’ve figured something out about a character, Steve Cavanagh will let you believe you’re a genius, waiting for the smug belief to settle into you before revealing a fact to shatter that belief instantly. There were several distinct moments in this book where I would read a sentence, feel shocked and disbelieving as I looked up from the book and shouted “What? !” Sitting between the inked lines of this book is hidden subtext which added a lot to the conclusion, most of it was hidden action which remain concealed from readers until the very end, or whenever it pleased Steve Cavanagh. All the characters are as confusing as the twists of the plot; there is no telling who is good or bad in the conventional terms of the words, they all committed acts on both sides of the line. As more about Daryl's past was revealed, he reminded me more and more of James from The End of the F**king World. Another unique character is Josephine Schneider, who is nothing more than a minor character in this book, but I almost wish she had a larger part. As for Paul’s wife, Maria Cooper, the story is partially narrated from her third person perspective which makes for an interesting viewpoint. Who doesn’t love a great twist? ‘Twisted’ is a book that sells itself on the fact that it has great ones. It’s right there in the title and it’s pretty clear that author Steve Cavanagh has spent a lot of time coming up with devious ways to trick and surprise his readers. Being a book about a writer, Cavanagh spends some time reflecting on the craft and on what makes a good twist. Reading the book I found myself thinking of truly great twists in novels and movies. Things like ‘Psycho’, ‘Fight Club’, ‘The Crying Game’, ‘The Usual Suspects’, ‘Behind Her Eyes’. It occurred to me that what the twists in those works have in common is that they change your perception of what has gone before. They make the reader or viewer reflect back on the story and characters and replay it with the new knowledge they have gained. That’s a really powerful thing because it makes you obsessively analyse the story. It’s why all the titles I’ve mentioned above are so memorable. None of the twists in ‘Twisted’ did that for me. They change the direction of the plot, but they didn’t have that kind of revelatory impact. To put it simply, I never had a “whoa!” moment. The other thing great twists have in common is that you don’t see them coming. You’re so wrapped up in the story that they hit you without warning. Because ‘Twisted’ sells itself on its twists I found myself constantly looking for them, so that when they did come, they weren’t that unexpected. Often, I’d spent so much time thinking about them that I’d already figured out what they were going to be. The biggest problem though, is that ‘Twisted’ really feels built around the turns in its plot. The characters and events are just there to carry you from one twist to another. As a result, I found myself not caring at all about what happened to the people I was reading about. That is the kiss of death for any book, no matter how good the twists are. Well I have come to the conclusion that Steve Cavanagh is without doubt a 100% genius!!! I really don’t have enough words to describe just how unique, compulsive and utterly brilliant this author is and I have read all of his books. Twisted is just what the title says and quite an understatement actually as it’s crazily twisted, full of drama, clever and totally unpredictable with a humdinger of a climax it was outstanding and I damn well loved every page. To write about the plot is impossible as Well I have come to the conclusion that Steve Cavanagh is without doubt a 100% genius!!! I really don’t have enough words to describe just how unique, compulsive and utterly brilliant this author is and I have read all of his books. 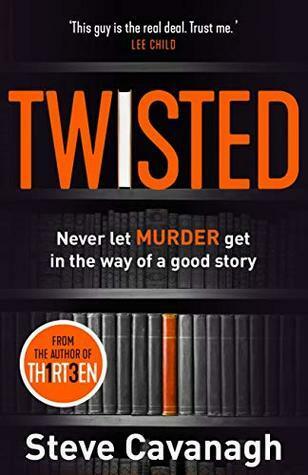 Twisted is just what the title says and quite an understatement actually as it’s crazily twisted, full of drama, clever and totally unpredictable with a humdinger of a climax it was outstanding and I damn well loved every page. To write about the plot is impossible as it just twists you up in knots and to say more would just spoil it , it’s going to be a huge hit and a well deserved one so just read it I can highly recommend it it’s a big 5+ star read. Having read Thirteen and enjoyed it I was looking forward to reading this standalone crime novel from Steve Cavanagh. Am not going to give much away, just going to say a reclusive writer of thrillers with a twist finds himself being accused of murder......let the game commence. This novel feels like the sort of novel Stephen King would write, Cavanagh is proving himself to be the next big thing in the crime writing genre. Many thanks to Netgalley for an early review copy of the book. Having read "Thirteen" after finally listening to all the recommendations I was really looking forward to "Twisted". The story here focusses on a fictitious author by the name of LeBeau. Almost nobody knows who he is, including his publishers. Despite the fact his books sell millions worldwide, he remains anonymous. Why? Is he just a recluse, or is there something more sinister to be told? It sounded like it was right up my street, unf Many thanks to Netgalley for an early review copy of the book. It sounded like it was right up my street, unfortunately it did very little for me. I couldn't connect with any of the characters in any kind of meaningful way. I found the sheer amount of "reveals" to be very off-putting which lead to me not really enjoying the storyline. The book is built on twists, so saying there is a twist in this case is not a spoiler. If you are looking for a saving grace here then it comes in the fact that I actually did find it interesting enough to finish - I was, however, annoyed when I did. How do you solve a problem like JT LeBeau? From the setup to the cataclysmic finale, you want more and boy do you get it! In lesser hands, this would have appeared to be an exercise in 'look how good I can write, ma! ', however, in the tradition of previous bestseller, 'Thirteen', Steve Cavanagh turns reality inside o How do you solve a problem like JT LeBeau? In lesser hands, this would have appeared to be an exercise in 'look how good I can write, ma! ', however, in the tradition of previous bestseller, 'Thirteen', Steve Cavanagh turns reality inside out by stating that every word that you read will be a lie (or is it? Is that a lie?) all centred on the enigmatic life and death of JT LeBeau. Playing with the unreliable narrator in a way that recalls to mind the master of this technique, Agatha Christie, Cavanagh will play with your mind as he opens with a funeral, a state affair with throngs of mourners, full on Hollywood prescence, armed guardsm the works for JT LeBeau. One person in the crowd is not who they seem, Paul , a hitman for hire (possibly) is stalking the crowd to take out one of the 4 people who know LeBeau's real identity . But before can do that, a revelation rings out louder than the intended shot of death but which lands with the full force of a bullet. And from then on in the twists come thick and fast as the plot backtracks to four months earlier and spins you around with multiple narratives, clues and red herrings coming at you thick and fast until you are left breathless at the pace.